He added that Oman is "very optimistic" about US President Donald Trump's peace plan saying the "solution will be beneficial for Israelis and Palestinians alike". Oman will not act as mediator in the Israeli-Palestinian peace process, though the gulf monarchy is willing to help, foreign affairs minister Yousuf bin Alawi bin Abdullah said on Saturday. Mr. Netanyahu's Office described the one-day visit as "a significant step in implementing the policy outlined by Prime Minister Netanyahu on deepening relations with the states of the region while leveraging Israel's advantages in security, technology and economic matters". The last meeting between leaders of the two nations was in 1996 when then-Prime Minister Shimon Peres visited Oman and Qatar. Palestinian president Mahmoud Abbas also visited Oman this week, according to the official Palestinian news agency Wafa. In August, Benjamin Netanyahu dropped a hint that Israel may join an anti-Iranian Arab coalition in the event Tehran blocks the Bab al-Mandab Strait, the southern entrance to the Red Sea. Oman's unique position in the region could also see it potentially play a role in mediating tensions between Israel and Iran, especially related to Syria. Palestinians have been boycotting the Trump administration since it chose to move the US Embassy to Jerusalem earlier this year. 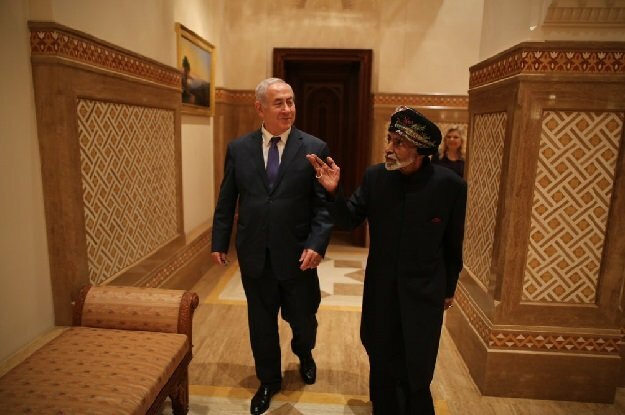 Like most Arab countries, Oman does not have formal diplomatic relations with Israel and it is rare for an Israeli leader to visit any of the neighbouring Middle Eastern countries. The only Arab states that recognize Israel are Jordan and Egypt. In October 2000, Oman closed the offices after the outbreak of the second Palestinian intifada. Before that, Peres' predecessor Yitzhak Rabin, was the first to visit in 1994.